“Back to the Future” fashions appeared recently in one of the Sunday magazines. But something was weird, I looked closer. Redwood sculpture of nine foot tall high fashion model. Most sculptors need some sort of rationale to do their job, even if they have to make it up. Here’s mine. Anthropologists’ dig (a thousand or two thousand years from now) unearths a funerary model from the tomb of a 21st century fashion king or queen. Aboriginal Burial Commission directs the model be sent back to the 21st century. And here it is, showing the effects of 1 or 2 millenia in the royal burial tomb. Back from the future, back and all. 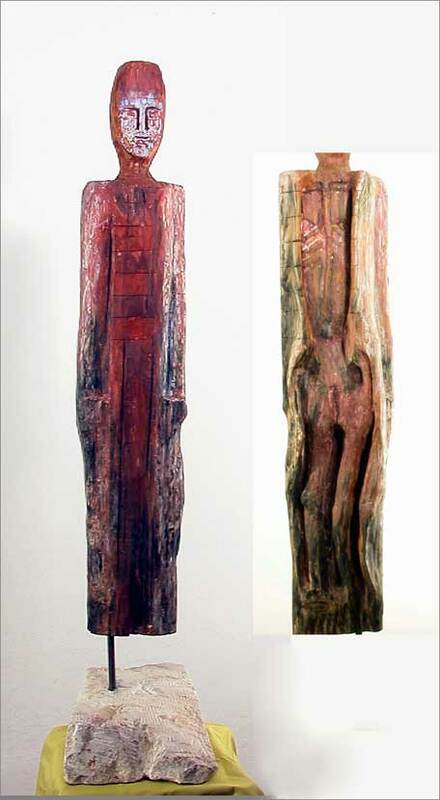 Funerary carving is about 32″ tall – I am fresh out of 9 foot redwood logs. Wood sculpture with fabric connected by knots. Fir carving is about bout 20″ tall, fabric trails about 4′. Image inspired by Hemingway’s Death in the Afternoon. Sometimes the three matadors stand together as they await the first bull of the afternoon. Sometimes the first matador stands alone. 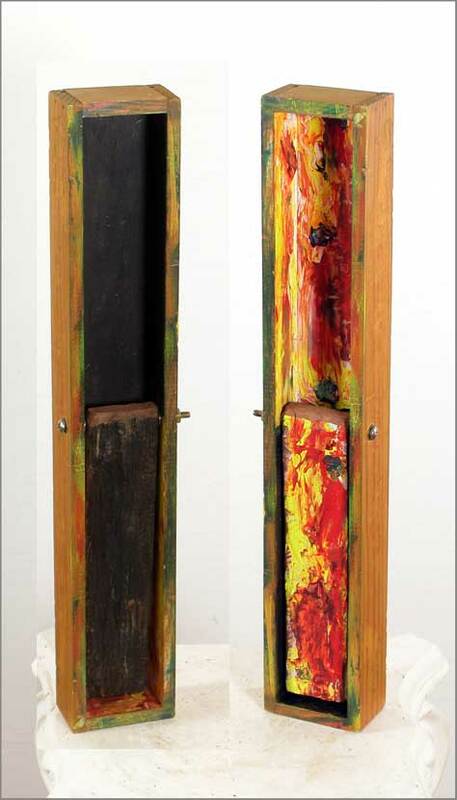 This piece was carved from doug fir kd 4 x 4 , painted in acrylic. 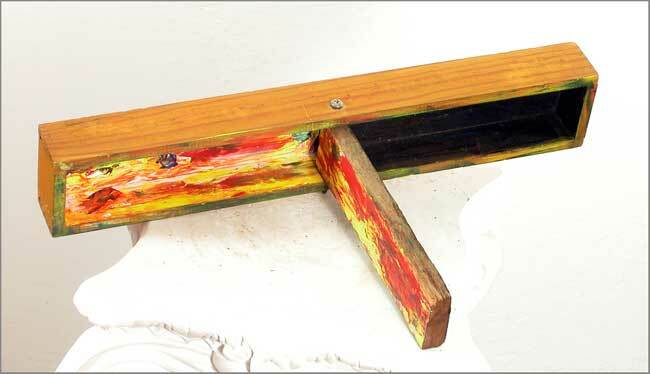 Bipolar Switch is a wood sculpture of connection, enabled by a common bolt as shown in open position, here. Manic mode appears below in right photo. Turn Bipolar Switch upside down to see Depressive mode, left. Switch from one mode to the other manually, there is no electrical connection. It is, after all, dysfunctional.